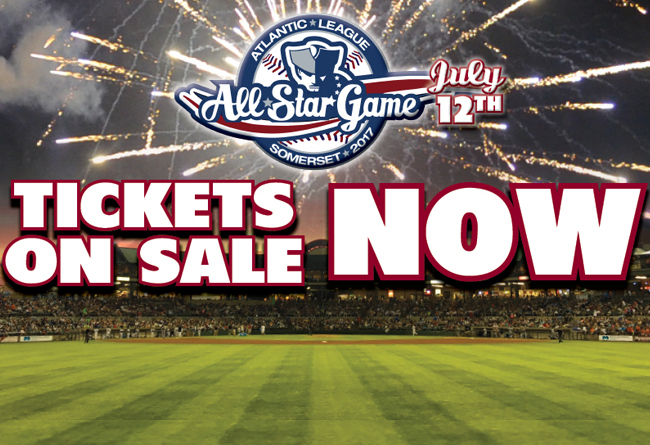 (Bridgewater, N.J., Feb. 6, 2017) – The Somerset Patriots have announced that individual tickets to the 2017 Atlantic League All-Star Game are now on sale. The game will take place at TD Bank Ballpark in Bridgewater, New Jersey on Wednesday, July 12th at 7:05 p.m. This year's theme will be a celebration of the area's Revolutionary War history to truly help all fans Get Patriotic! Tickets are available for purchase online at www.somersetpatriots.com and in-person at the Somerset Patriots Ticket Office. Tickets can also be purchased over the phone by calling (908) 252-0700. Individual ticket prices to the All-Star Game are consistent with single-game prices to 2017 Somerset Patriots regular-season home games. Fans can purchase Upper Box tickets for $11, Field Box tickets for $12 and Premium Field Box tickets for $14. This will mark the third time that the Somerset Patriots have hosted the Atlantic League All-Star Game. The team previously hosted the league’s Mid-Summer Classic in 2000 and most recently in 2008. The 2008 game welcomed 8,290 fans, which was an Atlantic League All-Star Game record, and featured honorary team captains Jim Frey and the late Don Zimmer. The 45th President of the United States, Donald Trump, also served as the event’s Honorary Chair and threw out the ceremonial first pitch. More information on the 2017 All-Star Game, including details regarding promotions, themes, giveaways and corresponding events, will be announced regularly leading up to the event.